Nix 22, Murray 75, Parker 90+3. Mansfield Town registered an important victory on the south coast this afternoon, after the demoralising defeats against Grimsby and Altrincham, with a 3-1 at Eastbourne Borough. This was not a convincing performance from the Stags but enough against a side who were terrible and had not won in the league since Oct 2nd. After Eastbourne had wasted six chances in the first 20 minutes, the Stags took the lead with Nix’s stooping header from Cain’s excellent cross. Eastbourne equalised early in the second half, but the Stags won it with an excellent goal from Adam Murray on 75 minutes and a late third in stoppage time from Keigan Parker. Ashley Cain and Tom Naylor, on their returns to the side, were particularly impressive and surely deserve to keep their places and a little run in the side. There had been a ferocious wind on the seafront in the morning, but it had dropped to almost nothing by kick-off, and the torrential rain of the previous few days had soaked through, leaving the pitch in reasonable condition considering. Duncan Russell reacted to the Grimsby and Alty horror shows by making six changes: Naylor and Foster for the injured Day and Cook in central defence, Cain for Briscoe in the right and Williams for Smith on the left, with Nix in for Istead in the middle and Parker back in for Connor up front. There were surprises all round when the Stags turned out in an all dark-blue kit with sky blue collar. Eastbourne were in red, which prevented the Stags from using the red and white usual away kit, but there would have been no clash with the Stags home kit. More on the new kit (audio here). Inside the first minute, Eastbourne created a chance when Norwood shanked a shot well wide from the right. A minute later little Jamie Taylor tried to chip Pilkington but it was an easy save for the keeper. On 6 minutes, Sandwith gave the ball away needlessly and Norwood again sliced wide of the right post in a near carbon copy of his earlier miss. It was a terrible start for the Stags repeatedly giving the ball away. A chance for the Stags on 10 minutes as Cain put in a great cross from the right and Parker was all alone on the edge of the six yard box to volley the ball high and wide. It was a bad miss. Masterton, making his debut on loan from Crawley, made space for himself but shot well wide on 14 minutes. On 15 minutes, Cain did very well to feed Parker but just as Parker was about to shoot, a defender cleared the ball for a corner. Parker was too slow. On 16 minutes, Dan Walker cut inside from the left and fired over. Then on 17 minutes, Walker’s left footed shot was soft and easy for Pilkington, as the Stags were now under pressure. On 20 minutes, Masterton shot from 35 yards with a dipping shot that heading just under the bar until Pilkington did really well to get back and tip it over. On 22 minutes, the Stags were in front, against the run of play. A good move as Duffy fed the ball to Cain on the right and Cain’s curling cross was perfect for Nix who stooped to head into the bottom left corner of the net from 6 yards, though keeper Banks got a hand on it. The home side had a shout for a penalty on 25 minutes as Norwood broke into the box on the right and got a little touch from Ryan Williams but didn’t go down. Had he gone down it would have been a certain penalty. On 29 minutes, Sandwith played a great ball down the left wing which evaded the last defender and Parker got to the byeline but with time to pick out a Stags player in the box, he fired a cross shot that gave keeper Banks an easy save. On 41 minutes, Nix’s corner from the left was met by a towering Tom Naylor, but Naylor was unable to direct it goalwards and his header went wide. A far from convincing half from Mansfield who frankly were lucky to come up against a side that had no shooting boots. 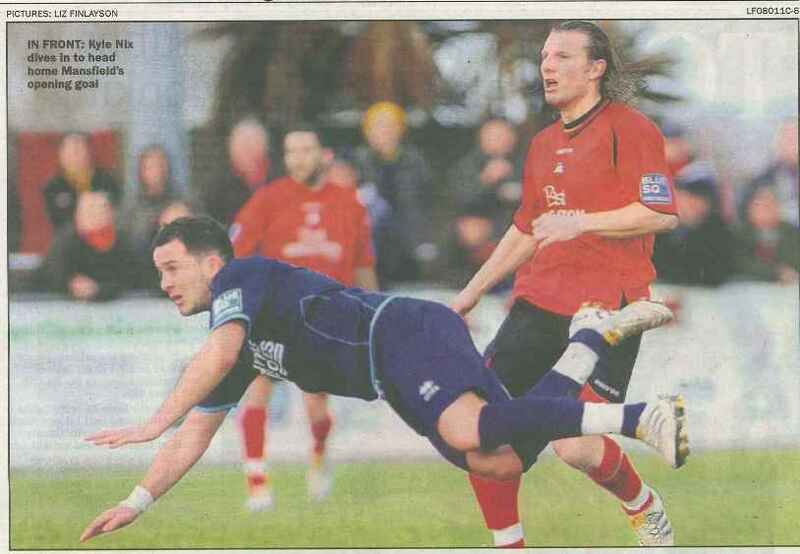 For example, had Alan Connell of Grimsby been playing the Stags could have been well adrift at the break. Duncan Russell had said before the game that he wanted the Stags keep it tight. We hadn’t really done that as the home side created plenty of shooting chances, it’s just that they missed them. A minute into the second half, Silk’s long ball forward was cleared to Ryan Williams, who seemed to have plenty of time to take aim, but pulled his shot wide of the left post. It was 1-1 on 53 minutes. Crabb got past Silk down the left and his low cross was side footed home by Jamie Taylor from 10 yards. The equaliser stung the Stags into action and suddenly we played with a new sense of urgency. On 54 minutes, Sandwith’s low shot from 20 yard was turned away by Banks. Then Cain had a shot blocked. On 57 minutes, Dan Walker cut inside and shot over the bar. Then on 59, Matt Crabb was just wide following a free kick taken from near the corner flag. And on 61 minutes, a good cross from Dan walker and sub Andy Atkin got the faintest of touches on it with his head sending it wide of the left post. Medley replaced Williams on 64 minutes. The Stags should have re-taken the lead on 69 minutes. A ball over the top from Silk was missed by the Eastbourne defence gifting it to Parker. Parker cut inside and was through on goal, but curled his left footed shot wide of the left post. It was another bad miss. On 72 minutes, it was Pilkington to the rescue as a Masterton free kick from the left was whipped in and headed towards the roof of the net before Pilkington tipped it over. A great save. Masterton then smacked a shot into the glass windows high above Pilkington’s goal. But Mansfield regained the lead on 75 minutes with a piece of class from Adam Murray. The ball run to Murray on the edge of the box, he turned and fired into the bottom right corner of the net. It was Murray’s second goal in 11 days, and another great finish. On 77 minutes, Eastbourne showed they were still in the game, as a mix-up between Pilkington and Naylor allowed Walker to poke the ball goalwards and Silk did well to clear it off the line. Then Smart shot wide from 18 yards. Connor replaced Duffy on 80 minutes. Then a cross from the left was headed over by Taylor, with Pilkington grateful to see it go over as he might not have got to it. Good play from Cain on 83 minutes with a great run, and he cut inside but his shot was blocked for a corner. Mills replaced Nix on 86 minutes. There was a heart in the mouth moment for Mansfield a minute into stoppage time as a free kick about 38 yards from goal on the right was flicked just wide by Eastbourne. But the Stags sealed it three minutes into stoppage time. Parker raced into the box on the right, cut past defenders and from a tight angle fired under the keeper and into the net. The Stags fans behind that goal were finally able to celebrate victory. So a vital three points for Mansfield which sets up a massive game against Fleetwood at Field Mill on Tuesday. Now is the time for Mansfield to come up with some consistency. Come on Mansfield! Pilkington 7 Two fine saves. No chance with the goal. Most of Eastbourne's shooting was wayward. Silk 6 Given a difficult afternoon by Matt Crabb, but got better as the game went on. Naylor 8 Assured and confident performance. Played very well and did well going forward. Deserves a run in the side now. Foster 7 Helped Naylor throughout the game. Won some good headers in defence. Sandwith 5 Some terrible passing, not a good game. Cain 8 Outstanding first half with some good runs and great crossing, including for the first goal. A bit quieter in the second half. Murray 5.5 Great goal, which was crucial to earn the victory, rescued his poor performance, with the ball given away too often. Nix 6 Good goal, surely his first from a header. Some good corners. Williams 6 Showed some good fighting spirit, but didn't really make any good runs down the wing. Duffy 7 Won just about everything in the air. Parker 5.5 Missed some good chances, but eventually came good with the third goal in stoppage time. Medley (for Williams, 64) 6 One outstanding run, but it came to nothing. Banks, Nelson, Austin, Elphick (Baker 44), Jenkins, Walker, Smart, Masterton, Matt Crabb, Norwood (Atkin 52, Nathan Crabb 65), Taylor. Subs Not Used: Brinkhurst, Strevett. John Busby (Oxfordshire) 6 Handled the game reasonably well.